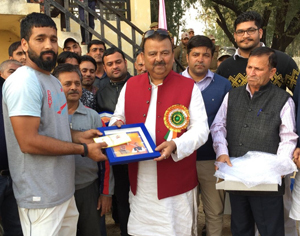 Minister for Industries and Commerce, Chander Prakash Ganga presenting memento to the winner during concluding ceremony of Cricket Tournament. SAMBA, Dec 4: Minister for Industries & Commerce, Chandra Prakash Ganga, today distributed prizes among the winners on the concluding day of 18th Baba Santhokh Nath Memorial Cricket Tournament. The Minister congratulated the organizers, winners and all the participants of the tournament. Chandra Prakash Ganga stressed the importance of sports in the personality development of the youth and expressed the hope that they will seize such opportunities and rise to success. He impressed upon the youth to participate in sports along with their studies, in order to achieve overall development and success in their future lives. He congratulated both the participating teams in general and said that winning and losing is not important but the most important aspect in the life is to come forward and be part of a competition. He stressed on the need to have more and more activities of sports in the rural areas as Government is going to establish a stadium in every district under “Khelo India” program. He added that our youth is very talented but there is need of providing proper training and infrastructure and the day is not away when our youth shine in national as well as international level competitions. 16 teams from various areas of the district participated in the tournament and final contest was played between Brigadier Tejinder Singh Club v/s Ever Shine Satwari. Brigadier Tejinder Singh Club set a target of 231 runs before Ever Shine Satwari. While chasing the target Ever Shine Satwari’s took the contest into a tight situation but remained short of six runs to lift the trophy.